If the theft deterrent system detects an inappropriate entry into the vehicle or the intrusion sensor detects movement in the vehicle which could result in the vehicle (with the intrusion sensor) or its contents being stolen, the alarm alerts the surrounding area of an abnormality by sounding the siren/horn and fl ashing the hazard warning lights. The intrusion sensor uses ultrasonic waves to detect movement inside the vehicle and to raise an alert of an intrusion into the vehicle. The intrusion sensor detects certain kinds of movement inside the vehicle, however, it may also respond to phenomenon outside the vehicle such as vibrations, loud noise, wind, and air currents. Do not hang clothing or objects from a head restraint or a coat hook. Return the extension sunvisors to their original positions. Do not blind the intrusion sensor by covering it or placing objects over it. Do not allow the intrusion sensor to get soiled or wipe it with a liquid. Do not shock or cause an impact to the intrusion sensor or the intrusion sensor bezel. Do not install seats or seat covers that are not Mazda genuine products. To prevent obstruction of intrusion sensor, do not place objects or cargo near the intrusion sensor that are higher than the head restraints. Unlocking a door with an inside doorlock knob. Forcing open a door, the bonnet or the liftgate/boot lid. Opening the bonnet by operating the bonnet release handle. 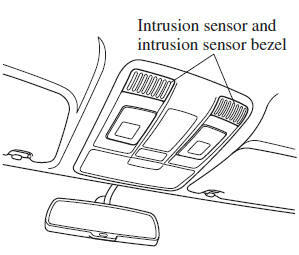 (With the intrusion sensor) The intrusion sensor detects a movement in the vehicle. The system will be triggered again (up to 10 times) if one of the above conditions remains. Disconnecting the battery terminal (the hazard warning lights do not fl ash). The system will be triggered about 10 times. The liftgate/boot lid does not open while the theft-deterrent system is operating. If the battery goes dead while the theft-deterrent system is armed, the siren will activate and the hazard warning lights will fl ash when the battery is charged or replaced. (With the intrusion sensor) Even with a window open, the system can be armed, however, leaving the windows even partially open can invite theft, and wind blowing into the vehicle could trigger the alarm. The intrusion sensor function can also be cancelled. Refer to Cancelling the Intrusion/Tilt Sensor on page 3-46 . Make sure the bonnet, the doors, and the liftgate/boot lid are closed. Press the lock button on the transmitter or lock the driver's door from the outside with the auxiliary key. The hazard warning lights will fl ash once. (With the advanced keyless function) Press a request switch. The security indicator light in the instrument panel fl ashes twice per second for 20 seconds. After 20 seconds, the system is fully armed. The theft deterrent system can also be armed by activating the auto relock function with all the doors, the liftgate/boot lid and the bonnet closed. Refer to Transmitter on page 3-4 . Pressing the electric liftgate/boot lid opener while the key is being carried. When the doors are locked by pressing the lock button on the transmitter or using the auxiliary key while the theft-deterrent system is armed, the hazard warning lights will fl ash once to indicate that the system is armed. If the theft deterrent system has been armed while any of the following conditions are present, cancel the intrusion sensor to prevent the alarm from triggering unnecessarily. Leaving the vehicle with a movable object, passengers or pets remaining inside. Leaving an object inside the vehicle that can roll around, such as when the vehicle is placed on a tilting, unstable surface when being shipped. Hanging small objects/accessories in the vehicle, hanging clothing on a coat hook, or placing other items which can move easily inside the vehicle. Parking in an area where there is strong vibration or loud noise. When using a high pressure or automatic car wash. Continuous shock and vibration from hail or thunder and lightning is transmitted to the vehicle. Doors are locked with a window left open. An accessory heater or device that produces moving air and vibration operates while the theft deterrent system is armed. If any door or the liftgate/boot lid remains closed for 30 seconds, all the doors and the liftgate/boot lid automatically re-lock and the theft deterrent system arms even if a window is left open. To cancel the intrusion sensor, press the intrusion sensor cancel button on the transmitter within 20 seconds after pressing the lock button. The hazard warning lights will fl ash three times. To reactivate the intrusion sensor, turn off the armed theft-deterrent system and then rearm it. The intrusion sensor is operational when the theft-deterrent system is armed. To cancel the intrusion sensor, press the intrusion sensor cancel button each time the theftdeterrent system is armed. Starting the engine with the push button start. Pressing a request switch on the doors. The hazard warning lights will fl ash twice. When the doors are unlocked by pressing the unlock button on the transmitter while the theft-deterrent system is turned off, the hazard warning lights will fl ash twice to indicate that the system is turned off. Pressing the unlock button or the boot button (saloon) on the transmitter. Mazda recommends that you affi x it to the lower rear corner of a front door window.